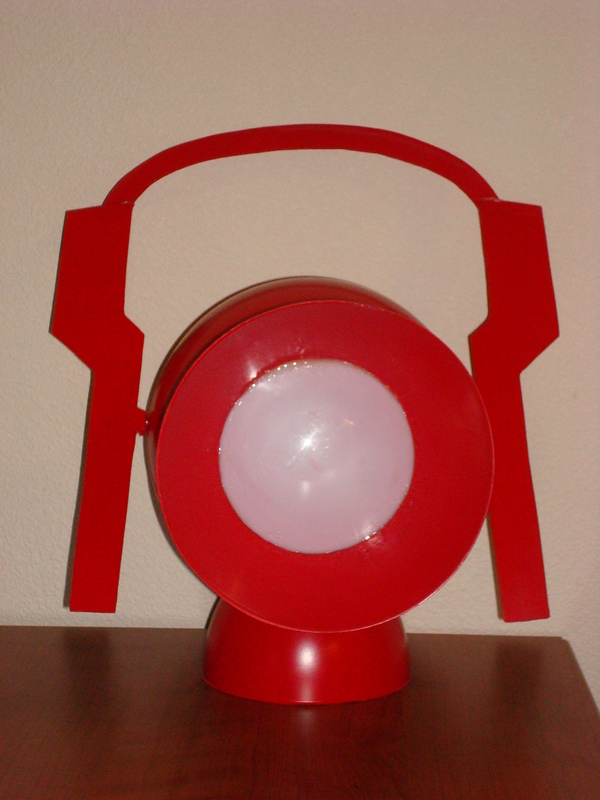 The Red Lantern Battery Prop! As many listeners of The LanternCast know, I’m a huge fan of Green Lantern. 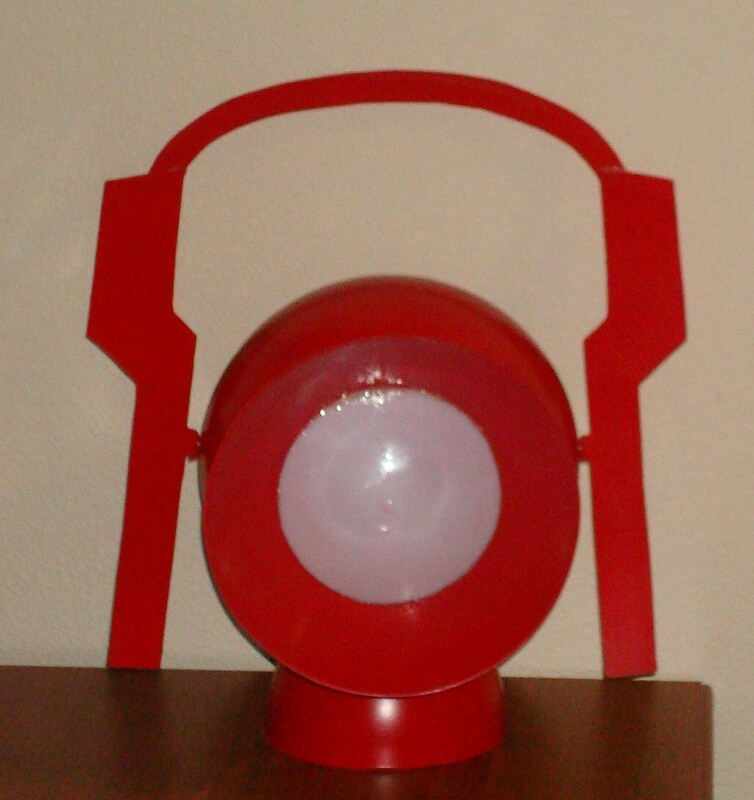 So much so that I even have 2 Power Battery Replicas, soon to be 3 when the Sinestro Corp Battery is released. 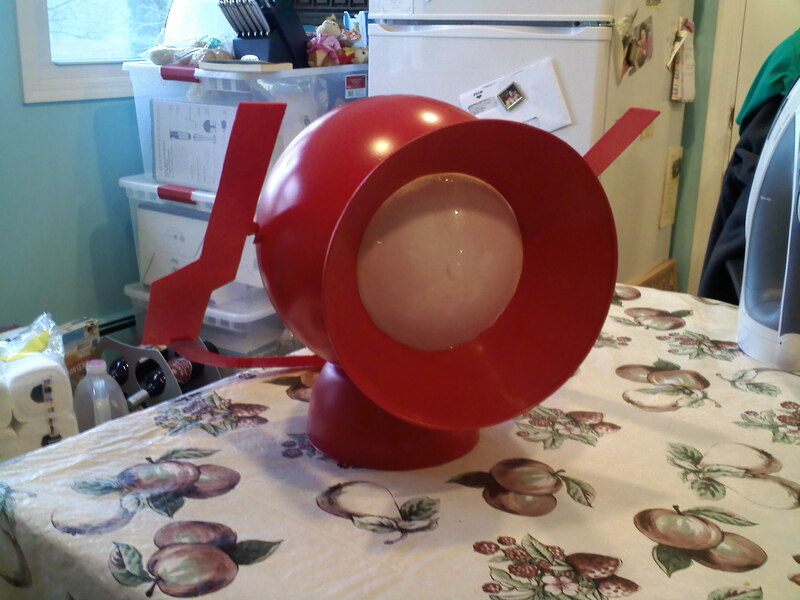 At the time this project was started though, I just had one, Hal’s Battery prop. When we started seeing the other color corps pop up in Green Lantern, new batteries were introduced, and the most visually stunning of them? The Red Power Battery! While most of the others are very similar looking, this one has a pretty distinct look. So I got to work making one! I had some suggestions from Billy Wamsley (Earth G Billy) and one other guy who had made a battery on Flikr (sorry guy who’s name I forgot!). This is a photo reference on how to make your own battery. There were a few things I forgot to take pictures of, so you may have to improvise in a few spots, but this will definitely help you on your way. To start off with, you need the round main piece of the battery. 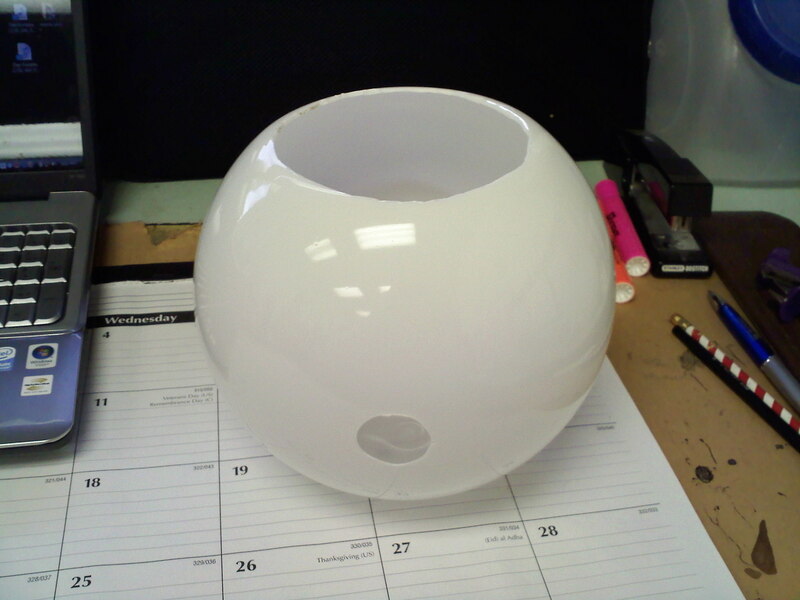 The best option for this is from Home Depot, it’s an ACRYLIC light cover. That is important to note. 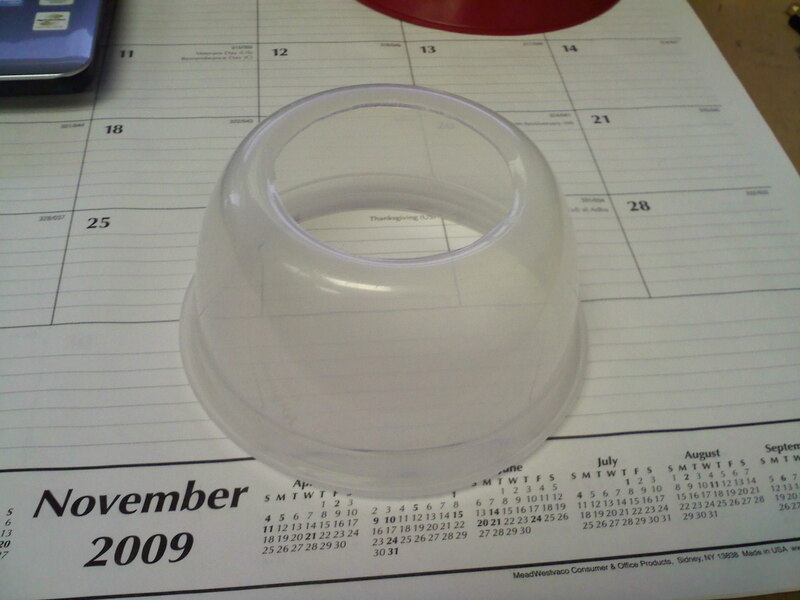 They sell these in acrylic (plastic) or glass, and you do not want the glass. They sell 2 sizes, a small one and another with a diameter of about 10 inches or so, give or take 2 inches. 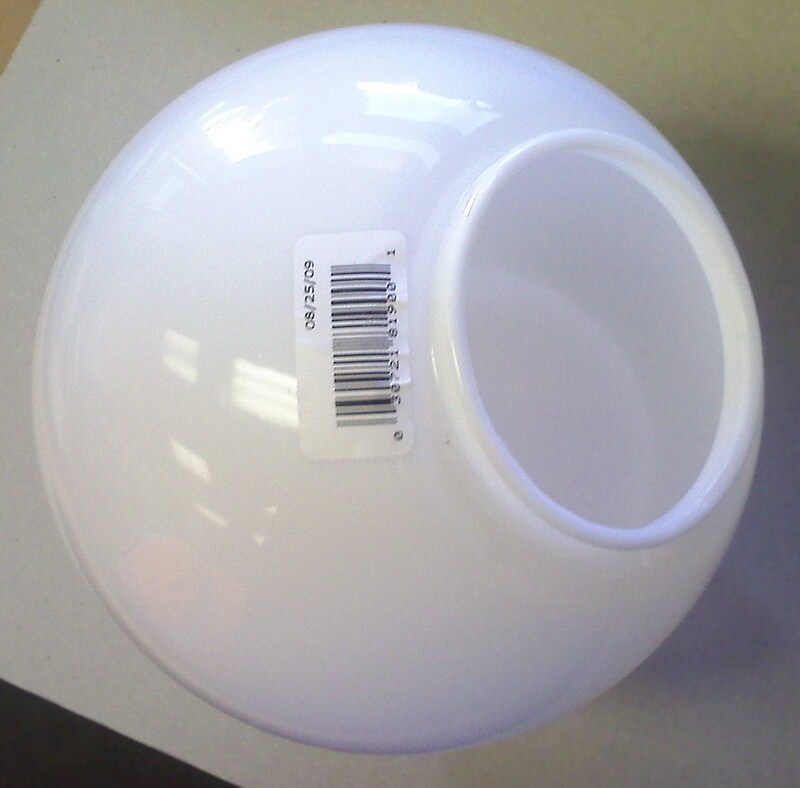 I’ve got pics of barcodes for most items, so that’s another tool you can use when looking for this ball/dome item. This should run you roughly 10 bucks or so. It’s also good to note that this ball is just about perfectly in scale with the actual Hal Jordan Battery prop, and would serve as an excellent base for any battery prop…except maybe indigo! Next up you need that part that kinda funells out of the battery’s lens. On Hal’s battery there are two of these, one in the fron and one in the back. On the Red Battery, there’s just one. For this you use – well what else? A funnel. If you know where to look you can find some of these parts so easily. 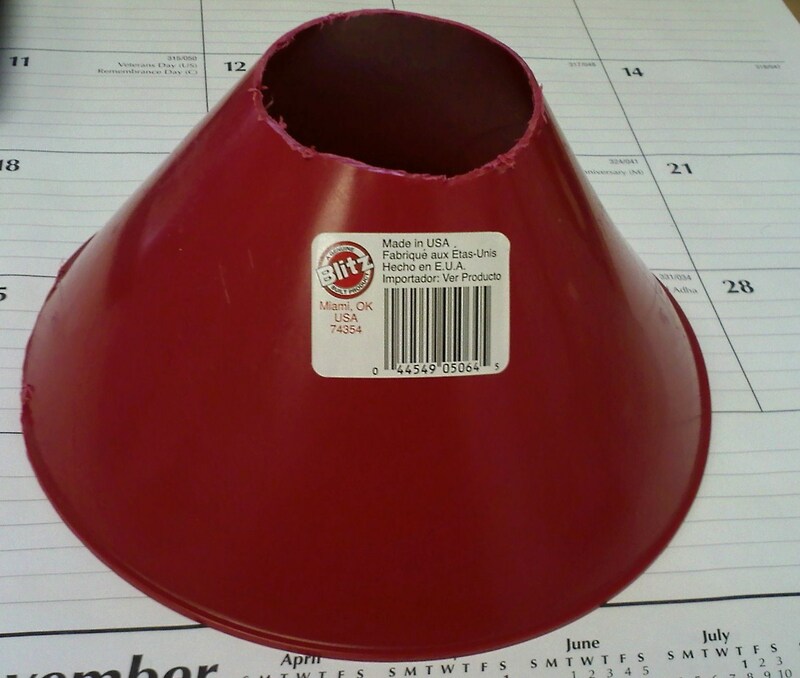 The funnel I used can be had for less than 2 bucks at Walmart…and is already red! 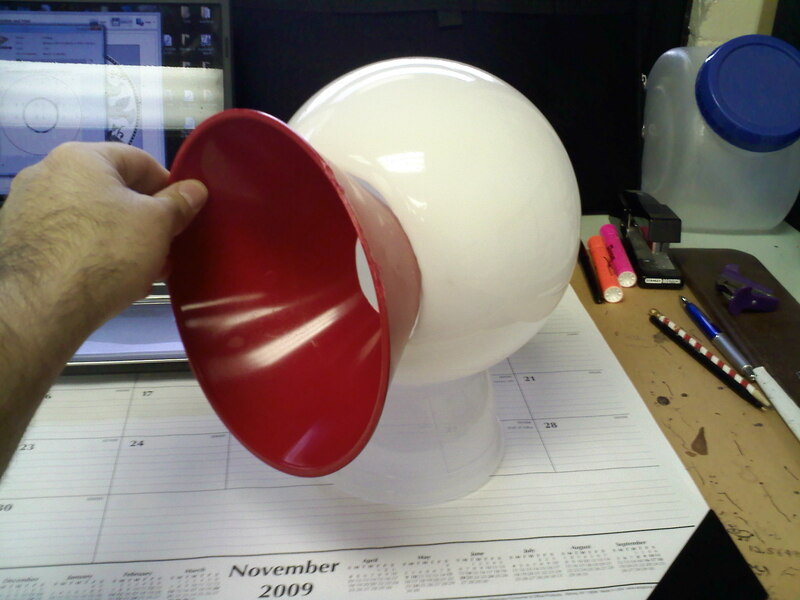 There are a few sizes of funnels, you want the one with an opening roughly 10 inches in diameter. 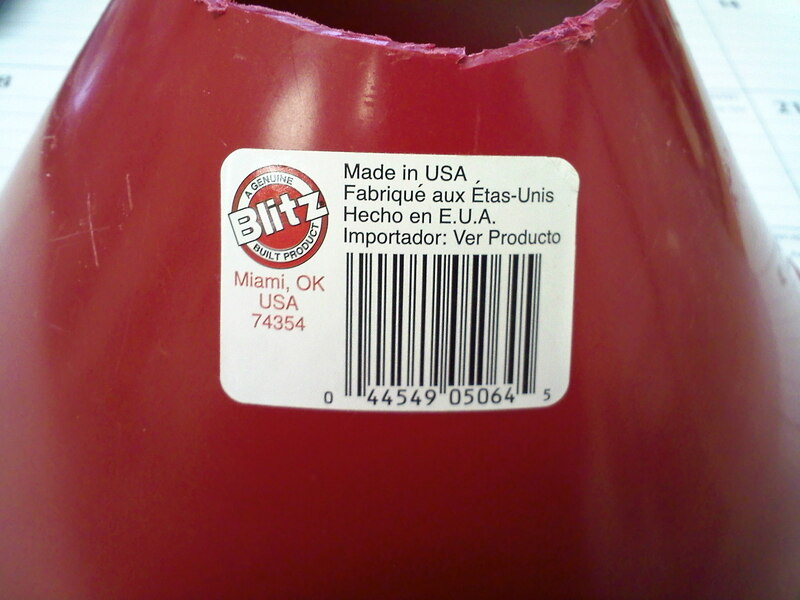 I think it may be the largest one they have, but in any case it’s red and you can see the barcode in the pictures. Now we focus on the base. If we were making any of the other batteries I would say take a trip to Home Depot and take a look at what they have down the plumbing aisle. 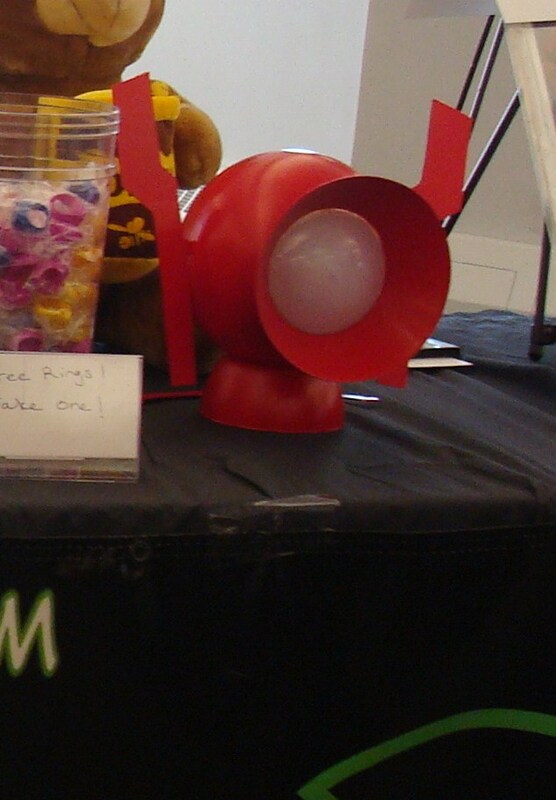 The step design of the other lanterns is easily replicated there. But for red it’s a bit more tricky, with the base being more rounded and no step. This is where you may have to improvise a bit, and do so to your own preferences. 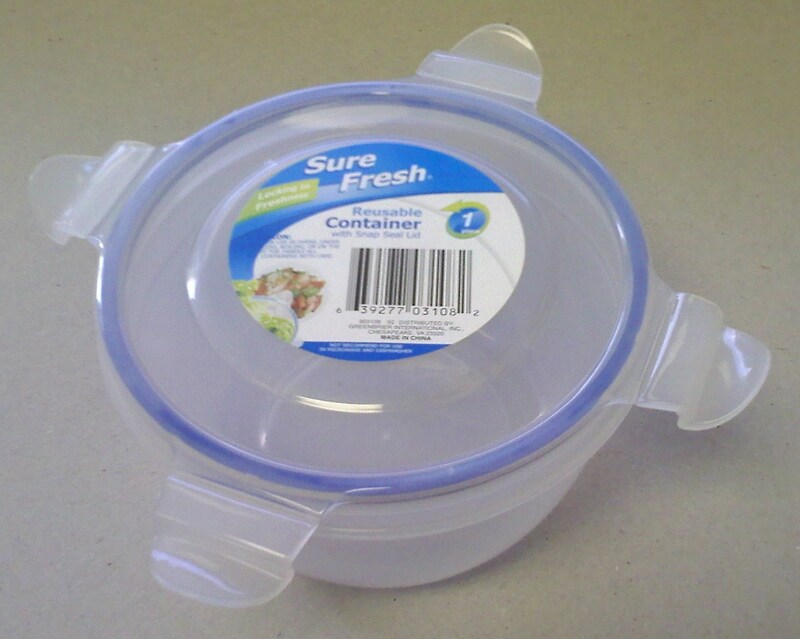 I found an awesome plastic food storage container that fit PERFECTLY, but I found it at a dollar tree, and I don’t know how easy it is to find the same items from store to store with them. 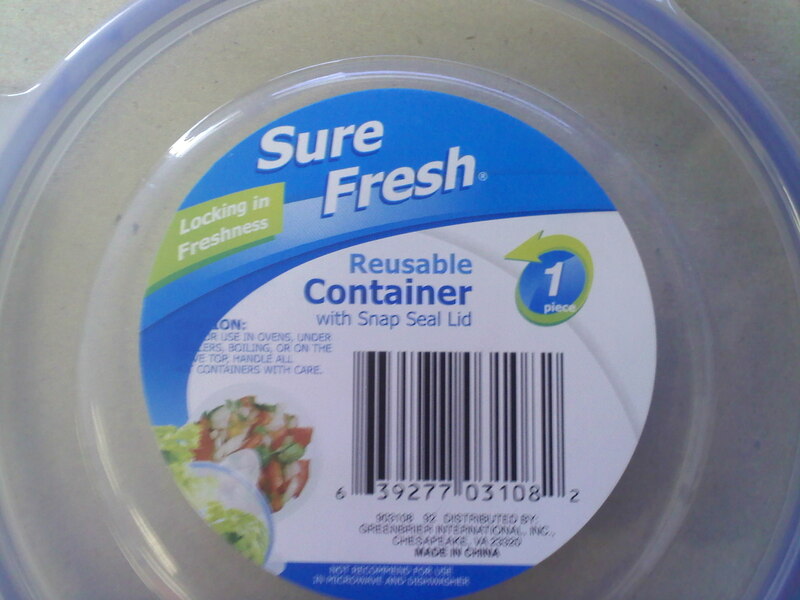 Anyway, it’s a Sure Fresh container, and you can see what it looks like from the pictures. 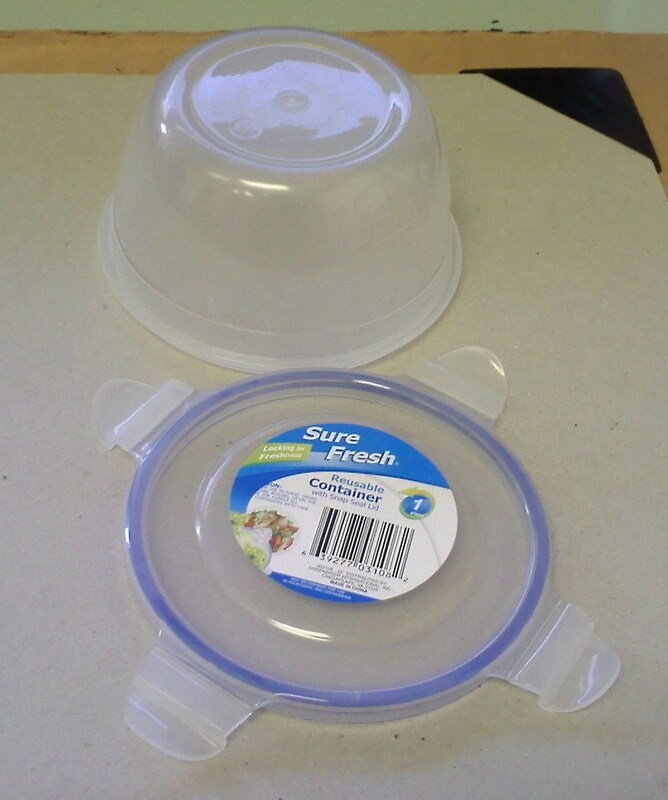 As I said though, this part depends on taste, so you can just as easily pop into your local food store and see what kinds of containers they have there. But looking in a dollar store means it cost just a dollar! For this next step, there are no pictures of what I used, but it doesn’t matter at all for this. What you need is a touch light. They can be found at some dollar stores, although mine were out of the round ones so I had to fork over 3 or 4 bucks at Target. 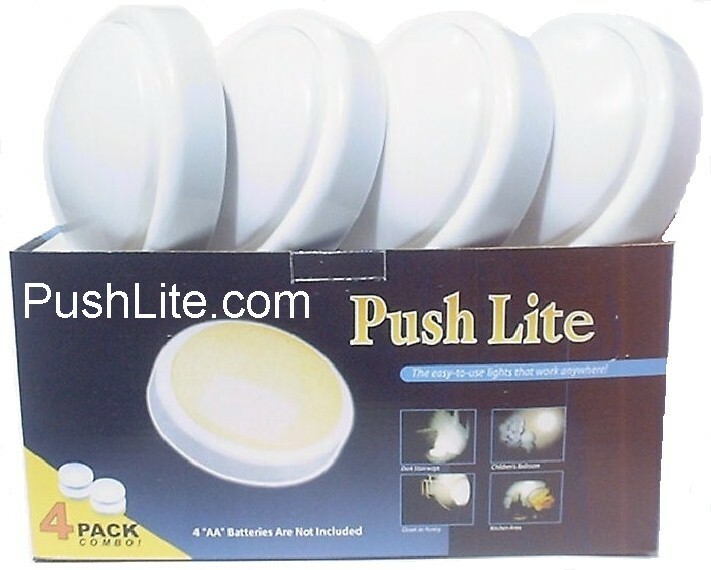 These are the round lights about 3 or 4 inches in diameter, about an inch high and go on and off when you tap the lens. This item is fantastic for power batteries, as I will detail later. I’m going to wait till later to detail the handle, since that came last for me. So now you have most of the pieces you need to get started. Hopefully you have a dremel or something, because you will need to do some cutting. As you can see from the pictures, you will need to cut off that lip to the acrylic dome, and add a hole in the bottom if you want to add lighting later on. The main opening in the dome is going to be the battery’s lens. A dremel works fine for cutting or sanding out the lip. Next up you need to work on your base. Again, dremel works fine at cutting or sanding off what you need. 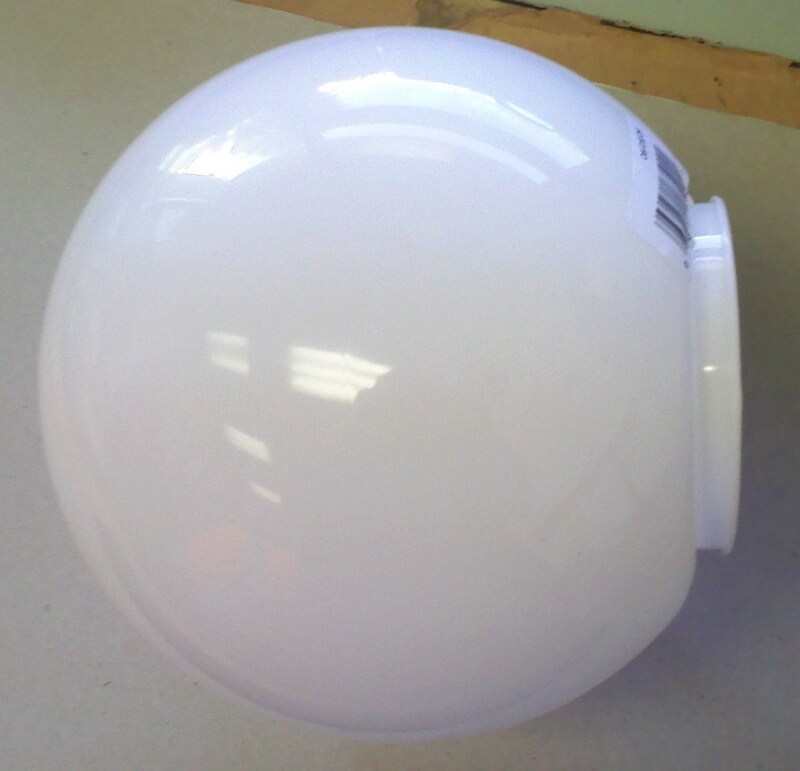 You can see what I cut out of the container, it’s enough so that the ball sits on top of it perfectly. I also ended up getting rid of the lip on here too, you can see that in later pictures. I suppose if you have a belt sander that can sand a larger area evenly, that would be best for getting rid of the lips, so that you have a nice even surface for everything. I didn’t have that, so I had some bumpy areas. Here you can see how well the ball sits on the base, with that hole in the bottom for wiring if you choose to add lighting (I didn’t due to time constraints). For the funnel, obviously it’s too long and you gotta get rid of that funnel piece.From the look of the picture, you can see the battery starting to come together, although I ended up making the funnel much shorter so that it gets glued to the lens, which gets glued to the ball. I suppose another way you could go about that is to not cut the funnel so short, mount the lens within the funnel, and have the funnel coming out of the ball. It might make things more stable in the long run. 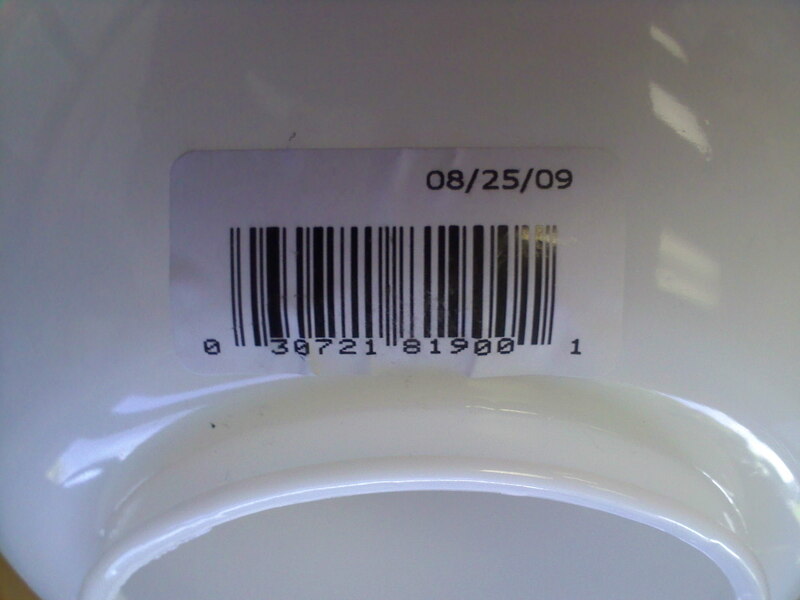 You will need to get rid of the tiny little nub/tag on the funnel. The cleaner you do that, the less work you have to do when working the ridge around the outer edge of the funnel. You’ll see when you get it, if you cut off the nub carefully enough, you can keep that ridge. Otherwise it’s kind of a pain sanding the whole thing off. So after you’ve worked all your pieces, you can do a bit of painting. Here’s where I made a mistake that you don’t have to. I figured I would have to sand the pieces a bit for a rougher surface that the paint could stick to. Turns out you don’t have to do that. Try to avoid sanding anything you don’t have to, it will make for a much smoother look. 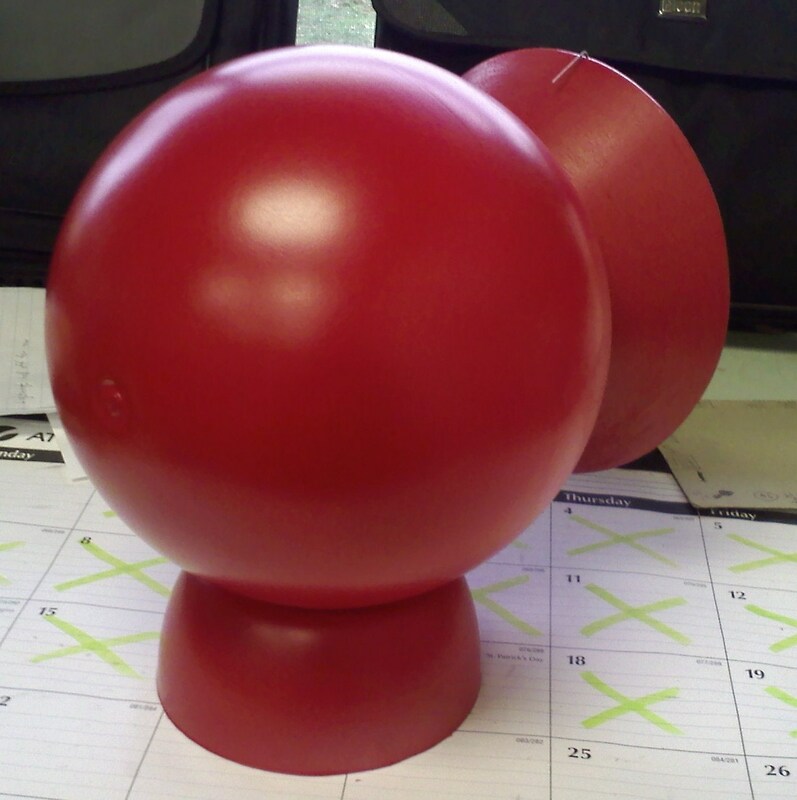 For paint, I used the Krylon red bonding paint that litterally bonds to plastic. The stuff is great. Covers fantastic, dries in minutes, bonds forever. I suggest you do your painting outside, on newspapers or brown paper bags. After the painting was done on these parts, it really starts to take shape. Now at this stage of the game, I wanted to have the battery ready for CGS Super Show 2010, and I had just days to complete the battery. I had a basic idea of how to make the handle, and then remembered what the handle looks like and knew that way would not work. 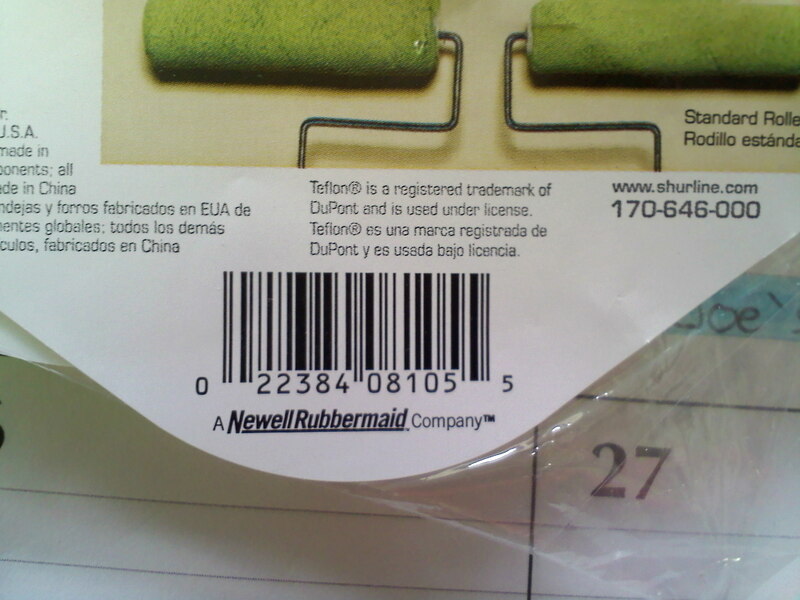 So, with no other options I took a stroll through Lowes Hardware store, hoping something would leap out at me. I also figured that at the very least, I could probably just get some wood and go from there, but that wouldn’t be easy. Well lo and behold, right down the paint aisle was my salvation. 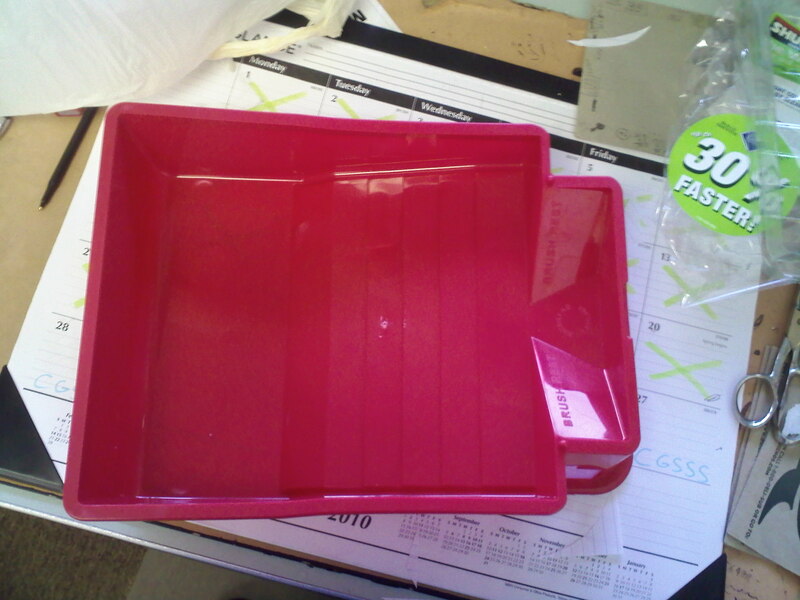 A red plastic paint tray! 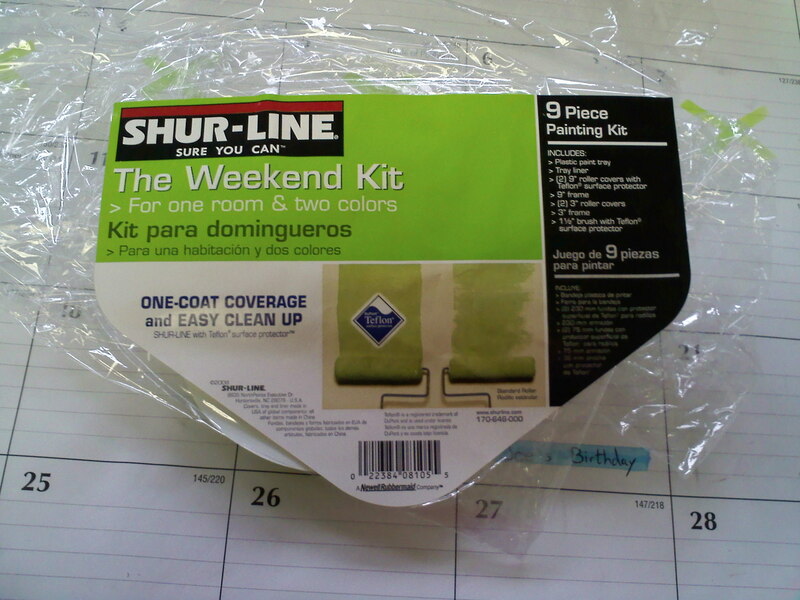 I saw what I needed right away, and this is something you will have to develop yourselves for future projects, being able to see what you need in something else.The paint tray was less than 9 bucks, came with a few paint rollers and brushes and was perfect. 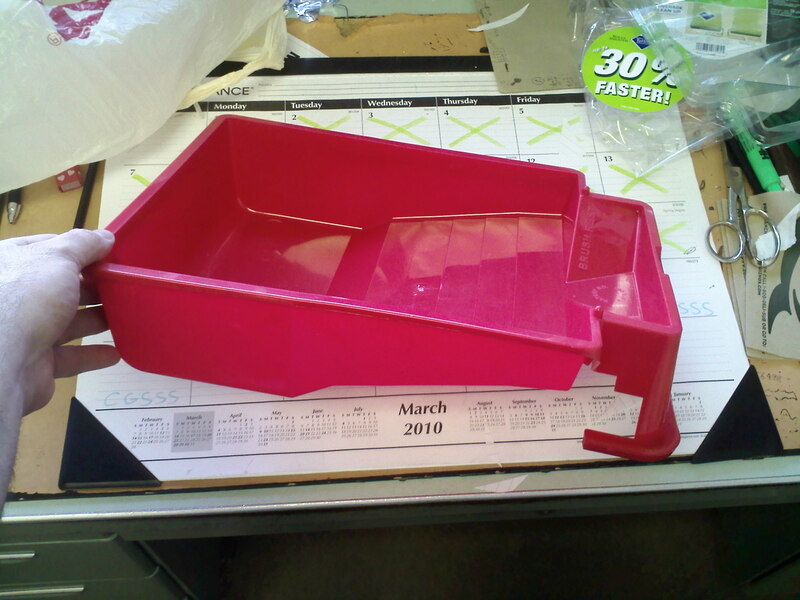 I didn’t take a picture in the package, but I’ve got the upc, and you basically just look for the red plastic paint tray with a total of 9 pieces for 1 price kinda thing. This part is a little trick now. I had the use of a grinding wheel which I used to carve out the design I needed. As you can see from the picture, you are keeping a little nub of the inner lip of the paint tray. That’s how you will connect the handles to the battery. Very simply, you drill a tiny hole in that little nub, and then a tiny hole in the sides of the lantern, and then go get 2 cotter pins from a hardware store to attach the handles. 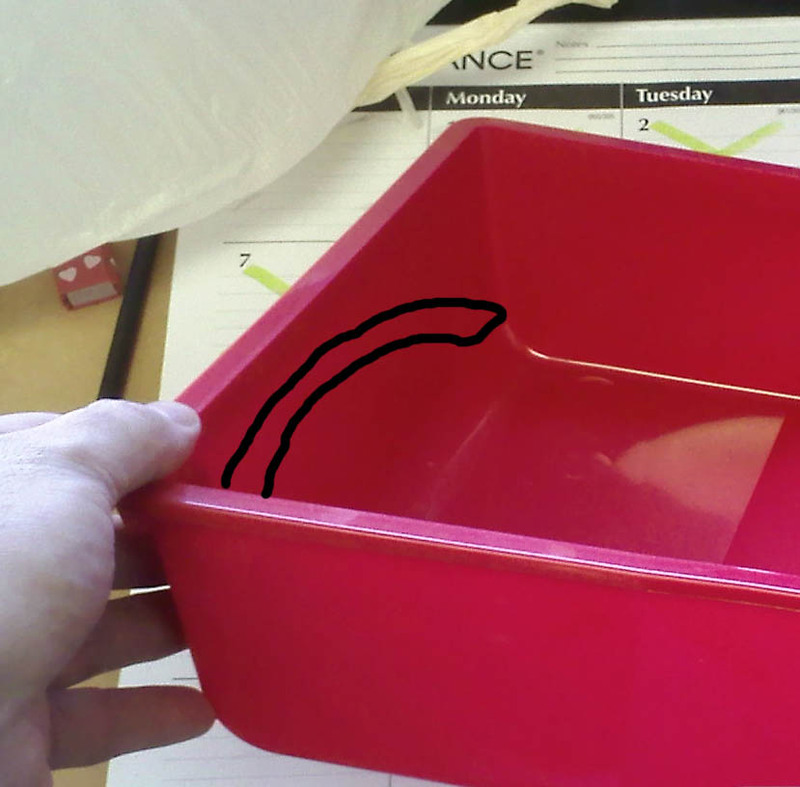 I didn’t have access to that though, so if you bend a paperclip you can get the same effect, just not as sturdy. Hopefully pic 20 gives you a good idea of what you have to do. For the top of the handle, this is tough. I used the back wall of the paint tray, as you can kinda see from pic 21. I don’t know if I’d recomend that though. It’s not very sturdy gluing the pieces together. If you’ve got some kind of industrial stapler that uses big strong staples, that would attach it much better, or else you may want to got with something else entirely for a more accurate top of the handle look. This worked well enough for me though I suppose. Now for assembly. Go out and get yourself some 2-part epoxy. That stuff dries hard and fast. 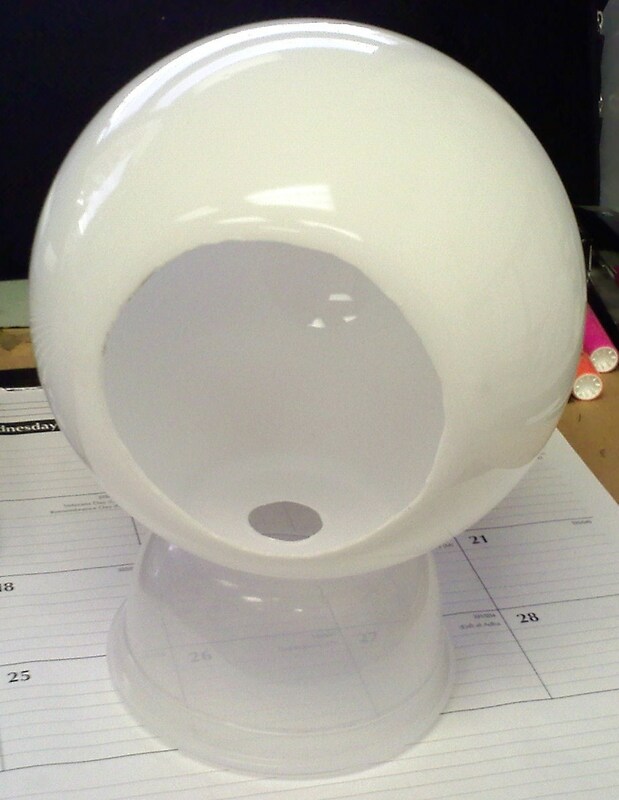 In certain areas, you really want to glob it on, like attaching the lens and funnel parts to the ball. That will make the connection stronger, although it will take a bit longer to dry. Oh, and I suppose this should go without saying, but don’t attach the lens yet if you plan on adding lighting. That would make things much tougher! And you want to attach the handles first, since once the lens is attached, you will no longer have a chance to bend the legs of the cotter pins out, which by the way attaches the handle nicely while also allowing for some nice 180º motion around the battery. 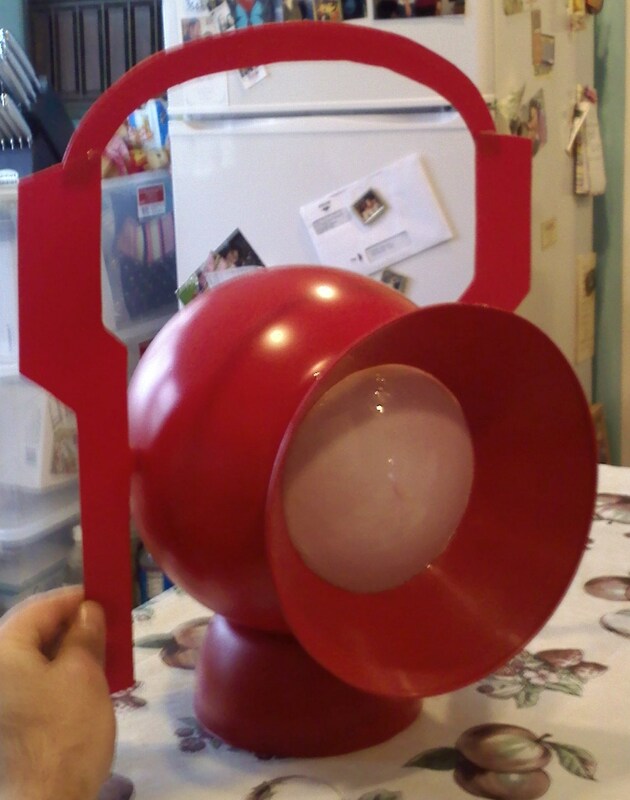 Now, for some additional tips, I painted the inside of the lens thinking it would tint the light red coming out of it. This was a horrible idea since it not only didn’t tint the outside part of the lens, but I also ended up not using lights! A MUCH better idea would be to go to the food store or Walmart and get yourself some red RIT dye. It’s mainly used for dying clothes, but if you boil some water in a pot (an old pot you don’t plan on using anymore) and then add the dye, you can dip the lens for a few seconds and you should get a really nice even tint that will allow light through and look awesome. For lighting, the click light that you bought for a lens has some awesome pieces you can use. It’s got a battery holder, a bulb (you may want to go the route of LEDs instead though) and also a switch! You’ll have to get a little creative on putting things together, but it’s very possible to do. Maybe mount the switch on the inside of the lens, drilling just a tiny hole in the lens for the push button to come out, so when you raise your ring to the battery, that triggers the light! If you add lights, the batteries would fit great in the base. If you don’t go that route, you may want to make a bottom for your base and fill it with something (sand?) so that it has a bit of weight and keeps the battery upright when you are holding it. And this final picture is the Battery at Supershow. Our friend Leroy broke the handle off, so I had to reglue it together Saturday night in time for our Sunday raffle. It’s just as well that it broke, it gave me a chance to give it a stronger connection. But that is something to watch out for. Good luck on making your own batteries, and if you do make one, send me pics and I’ll post them up here!